Driving the six ‘Central Alps Mountain Passes’ around Andermatt in Switzerland: where, when, how long and where next? 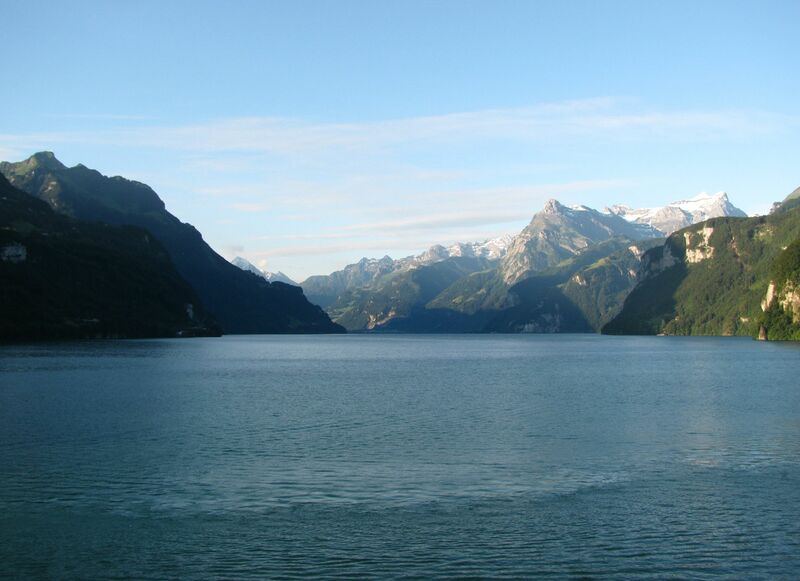 The view from the Seehotel Waldstatterhof in Brunnen, thirty miles north of Andermatt on the A2. The day dawned bright and clear. Damn! The last hope had been that bad weather would shut all the roads on The Loop – Das Loop – the six super-high mountain roads, not one less than 2000m (6,500ft), around Andermatt in south central Switzerland. After two weeks in the mountains you might have thought we’d be used to it by now and we were, to a certain extent – enjoying it even – but most of the others were spaced apart with time to calm down in between. These six are all literally one straight after the other. That was a vain hope too. The total distance covered turned out to be 190 miles. We started at 11:00 and finished at 17:30 for an average speed, including one short break, of 29.2mph. I’m surprised it was that high. One thing that wasn’t a problem was tourist traffic. Even in early July, apart from the road work’s queue on the Gotthard Pass, we had most of the roads to ourselves. That’s encouraging because they have a very short operating window. You can’t bank on them all being open outside of mid-June to early October. On top of that, mountain weather can mean one or all of them being shut at short notice. Even after a whole day of clear skies, just before we drove Furka the cloud was visibly descending and it started to rain. On the other hand it does have to be pretty bad for the Swiss to shut roads – see Oberalppass. Driving the loop without repeated yourself too much is tricky. The way we went – Gotthard (Tremola), Nufenen, Grimsel, Susten, Furka – meant doubling up only on the first part of Gotthard and the stretch of Furkastrasse between Gletsch and Innertkirchen (albeit in the opposite direction). Of course, to truly experience these roads you have to drive them both ways. To do that it one day you’d have to start early, drive fast, be lucky and take no breaks.. The big question then is where next? After Furka we headed south west to Brig and got the Simplon Pass over to Italy (then motorwayed to the Mediterranean, arriving at 21:45). To the east of Andermatt is Oberalppass to Graubünden (east Switzerland), then Lenzerheide and Julier Passes down to St Moritz, Bernina Pass, Albula Pass, Davos, Fluela Pass and all the rest (see PassFinder). If you really want to scare yourself head north on the A2 for twenty miles to Altdorf and take H4/H17 Klausen Pass towards Zurich. ‘The Loop’, six mountain passes around Andermatt in south central Switzerland. See here for Gotthard Pass and Tremola, Nufenen Pass, Grimsel Pass, Susten Pass and Furka Pass. ← Das Loop #6: Furka Pass.